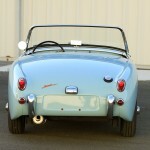 -Fully Restored Bugeye in Iris Blue. 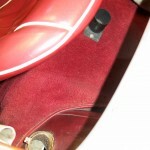 -Exceptional panel gaps and finishes throughout. 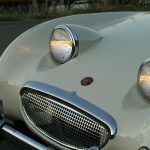 -Converted to flip-front hood with reinforcements. 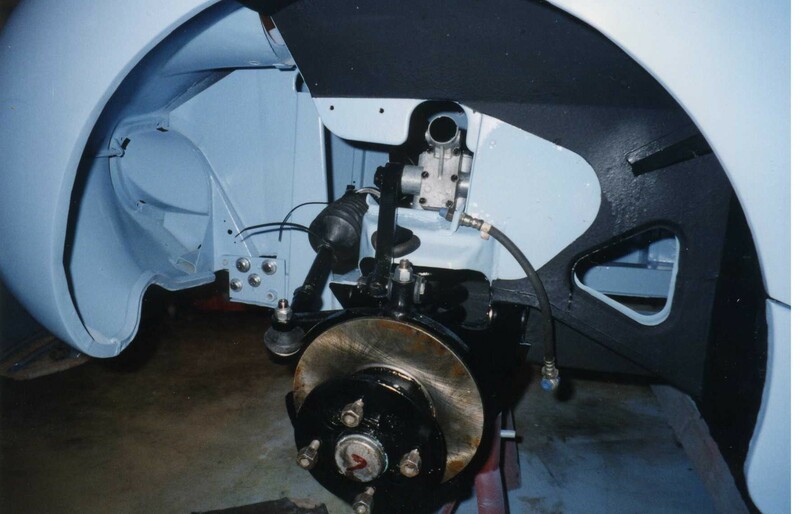 -Upgraded to front disc brakes. 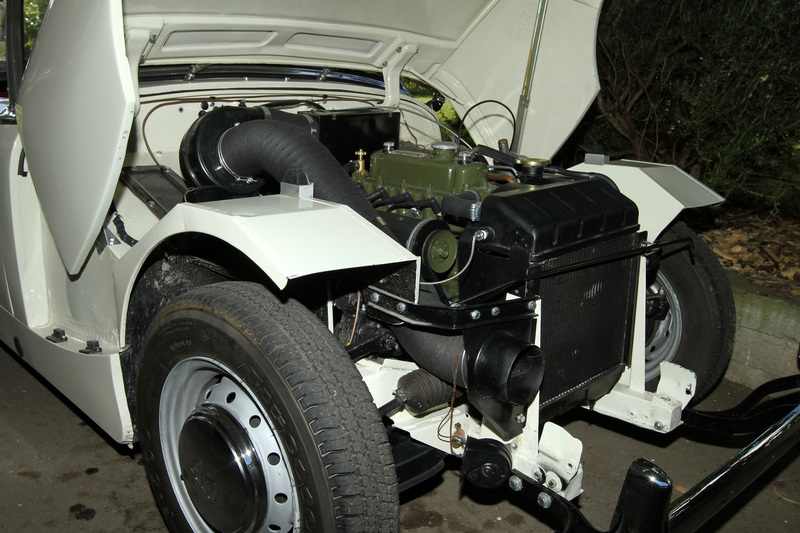 -Fitted with rechromed original front grill. 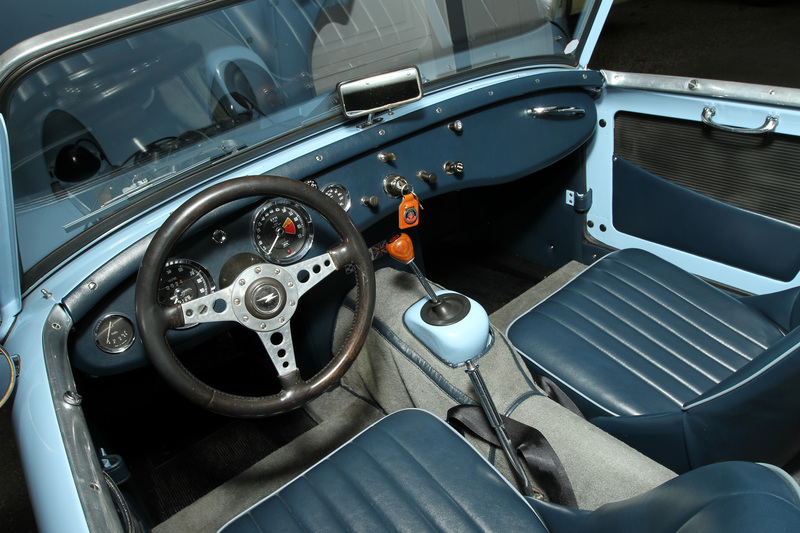 -One of the best handling and driving Bugeyes. 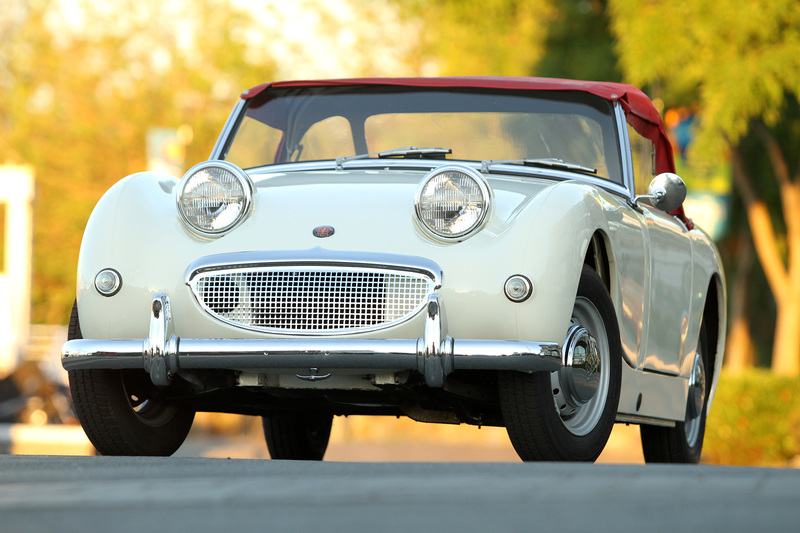 Sold: 1960 Austin Healey Bugeye Sprite. 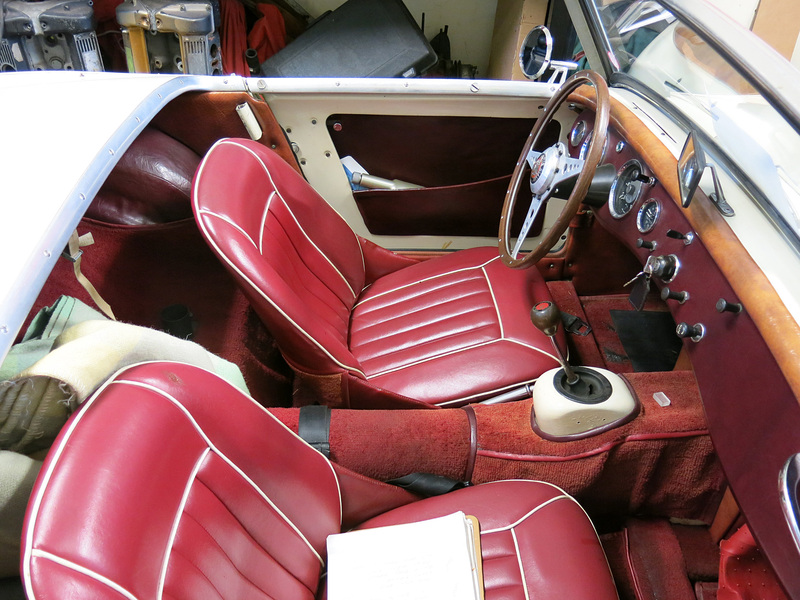 -Recently restored to original specification and in striking Old English White over red interior. 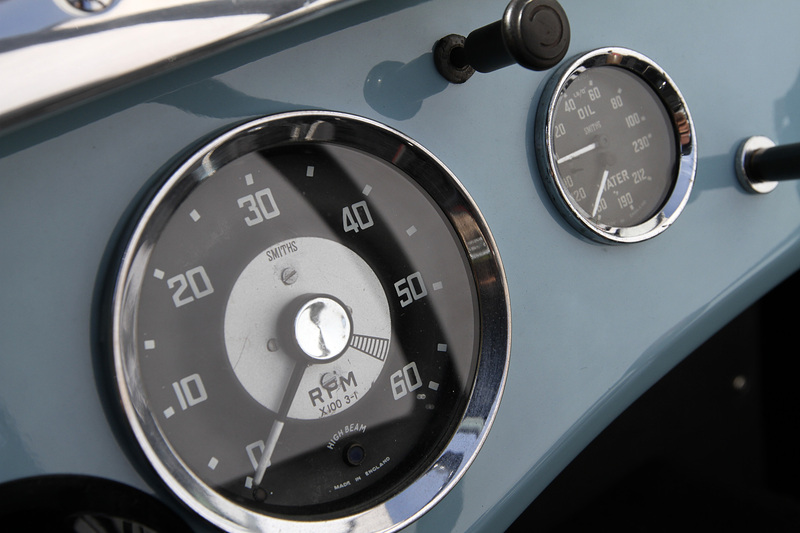 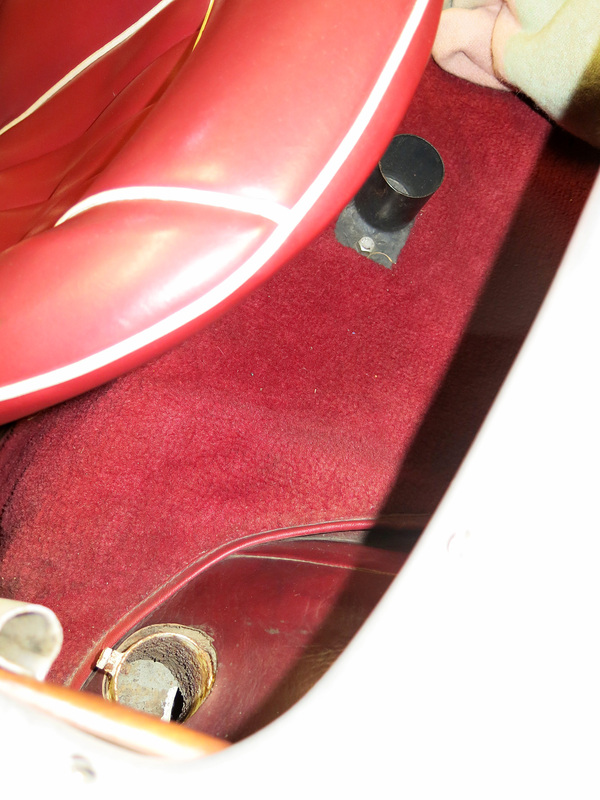 -rare to find these in original specification, unmodified from new. 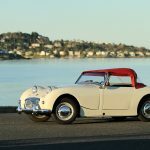 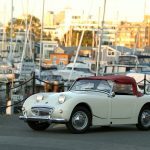 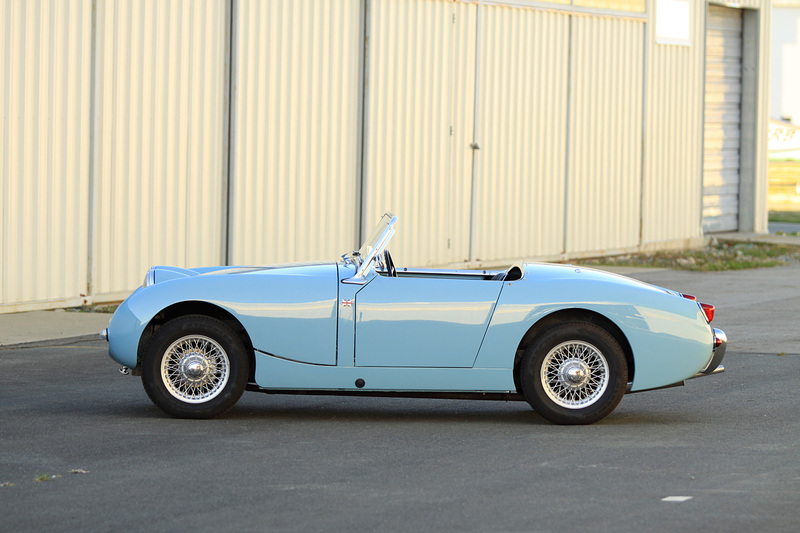 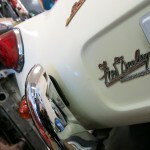 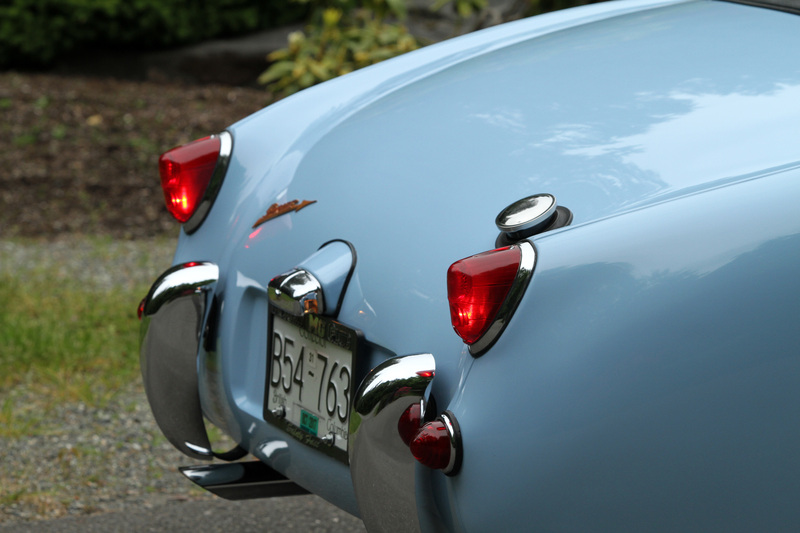 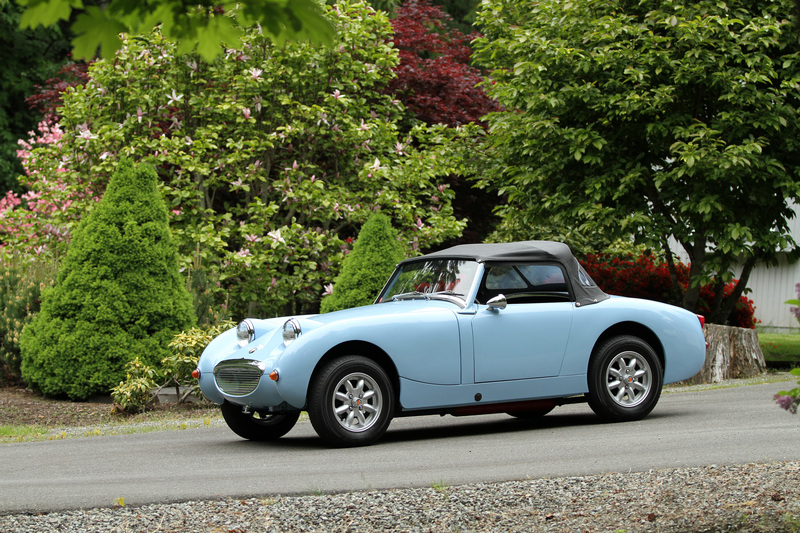 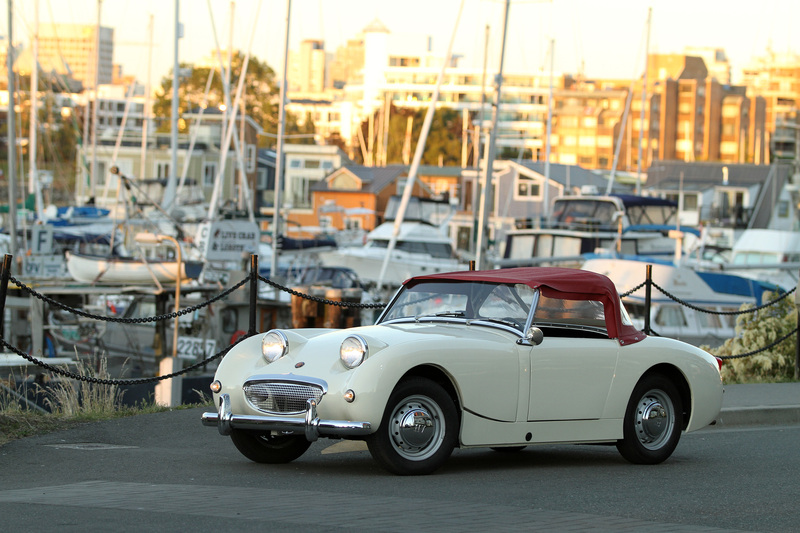 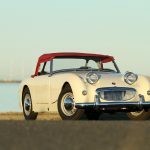 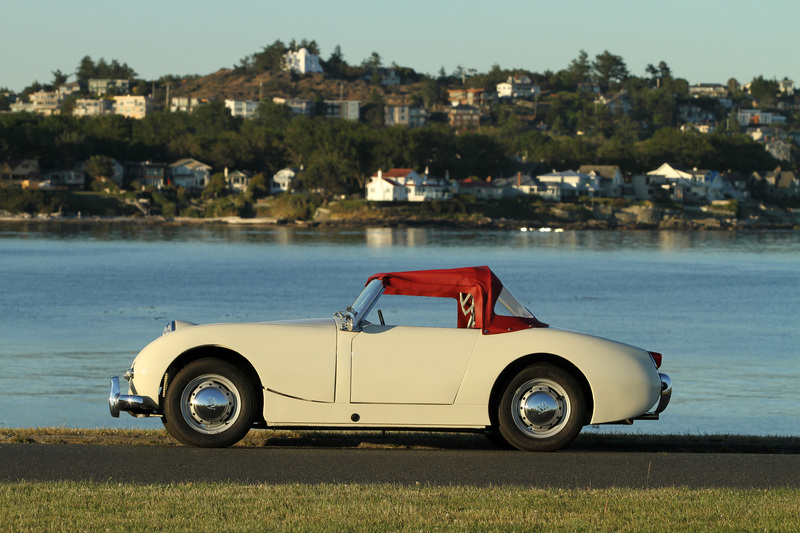 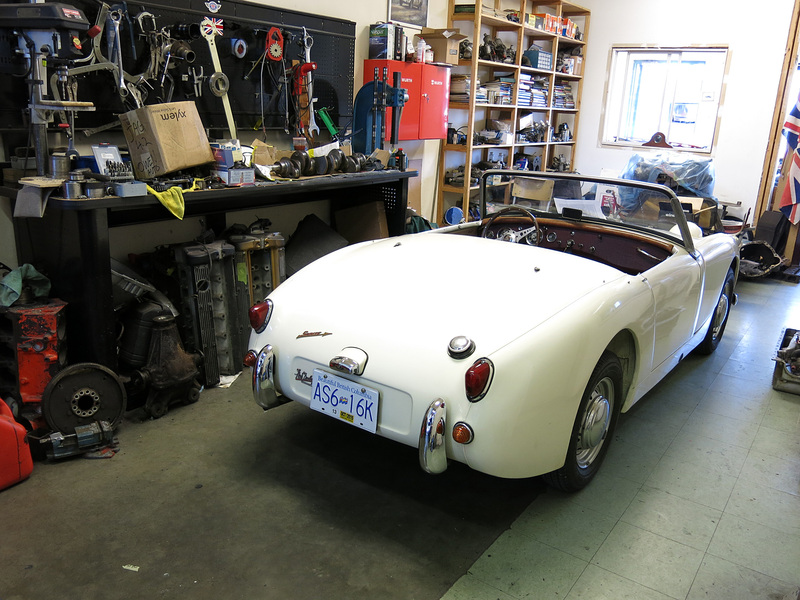 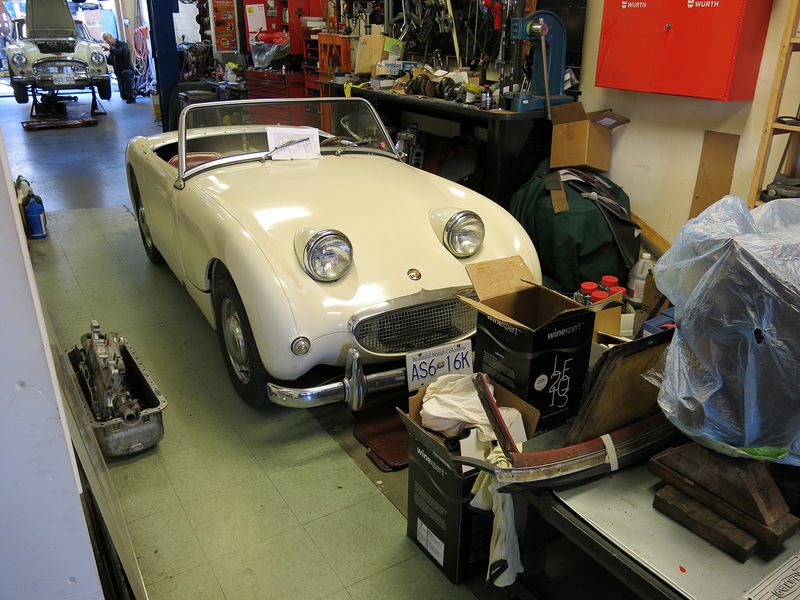 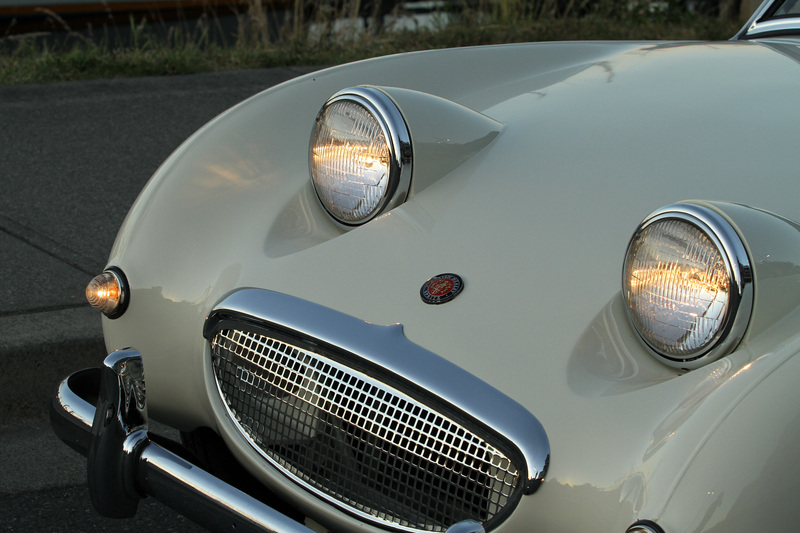 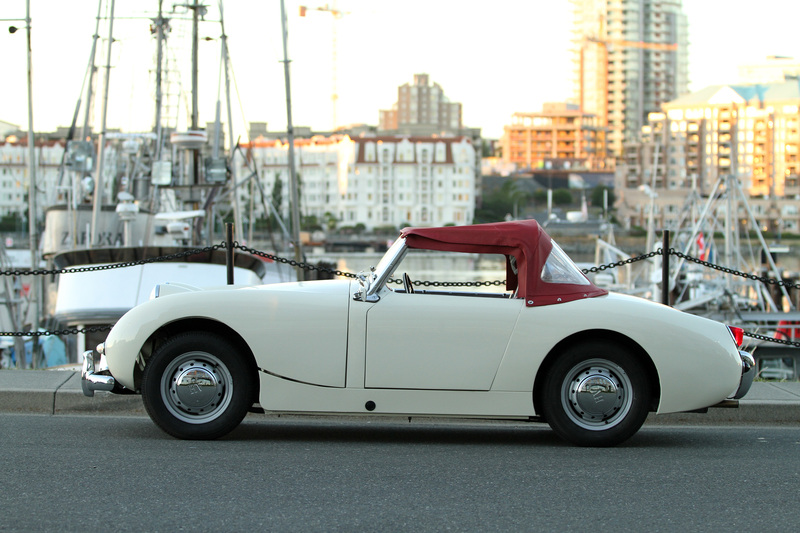 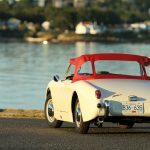 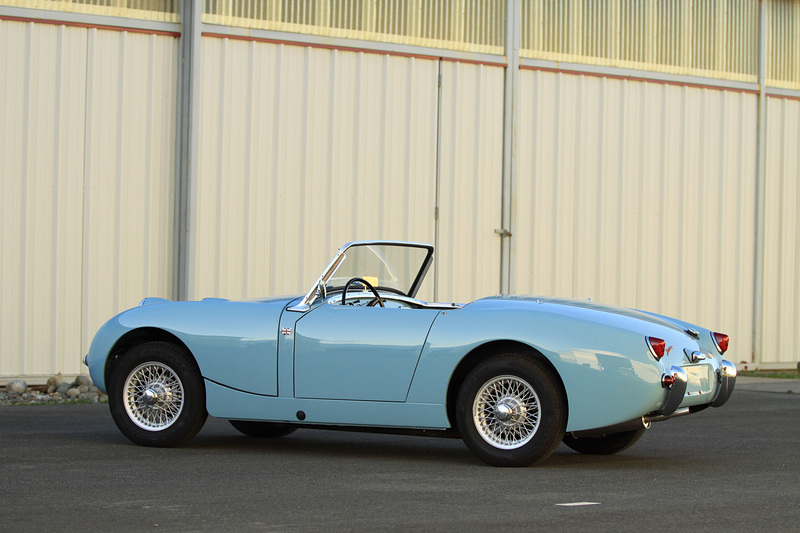 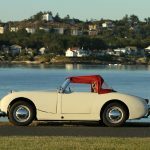 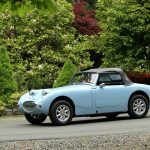 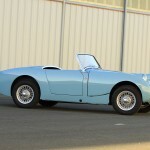 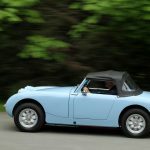 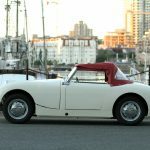 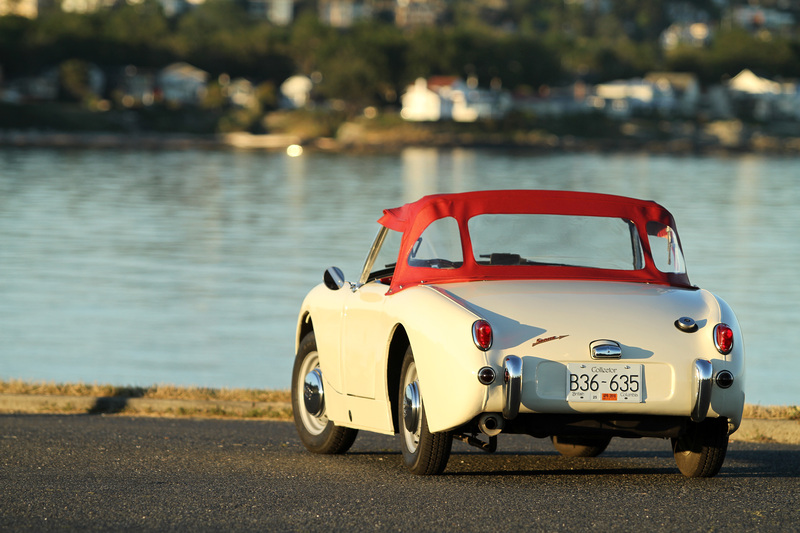 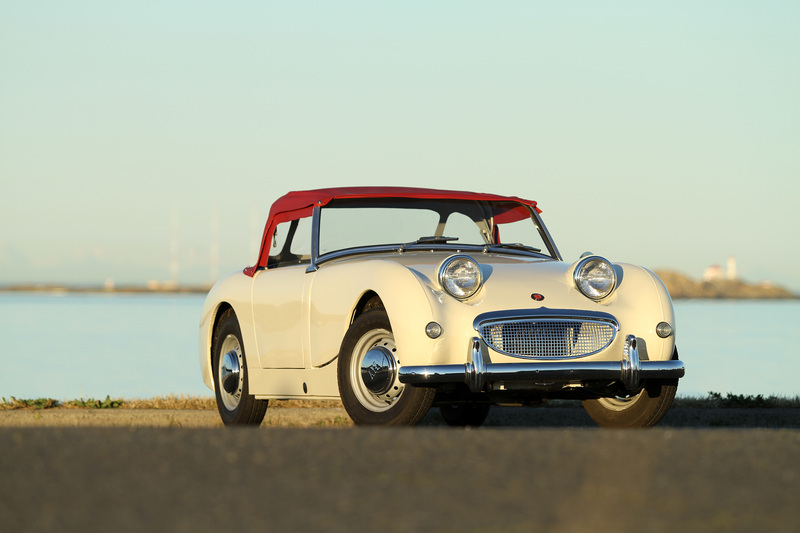 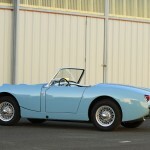 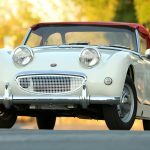 Just recently this Austin-Healey ‘Bugeye’ Sprite surfaced from the deep Cowichan and into our shop. 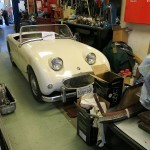 It has recently passed on to a new owner with almost enough pieces to make another car! 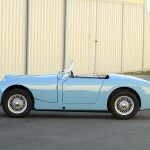 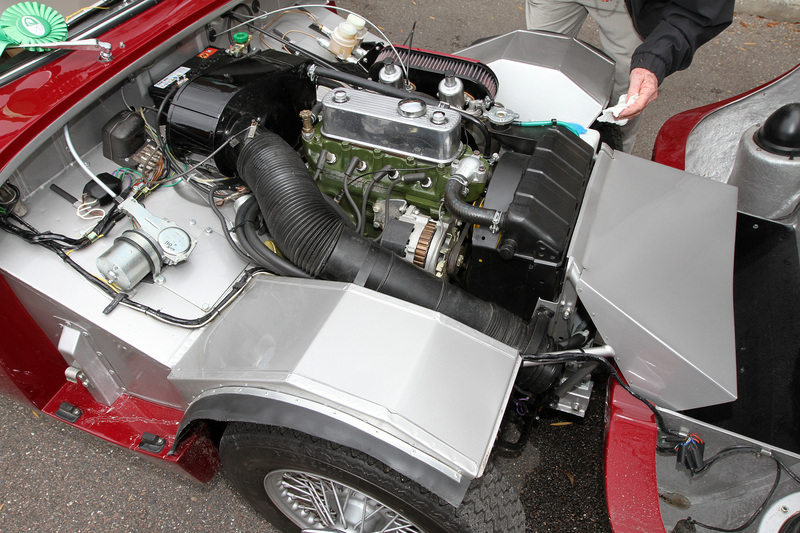 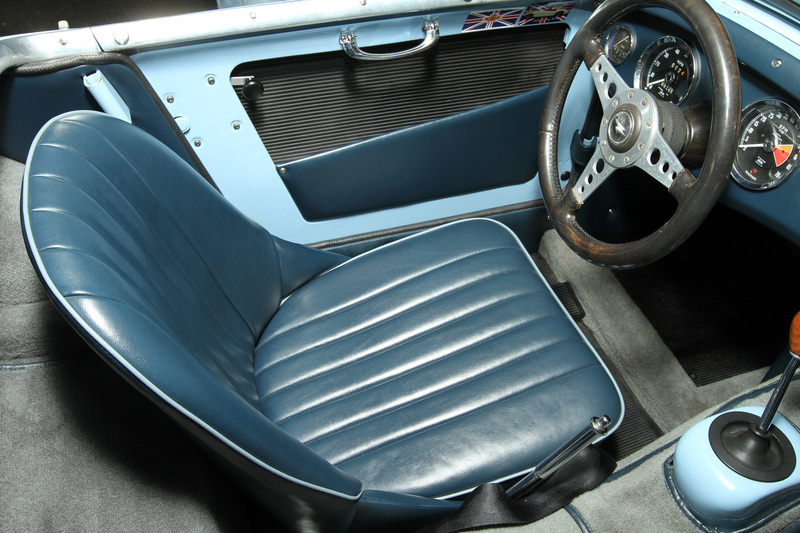 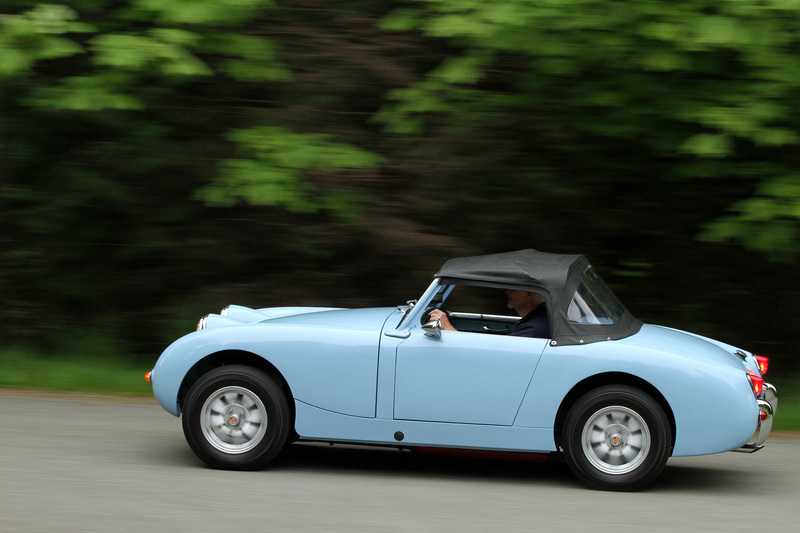 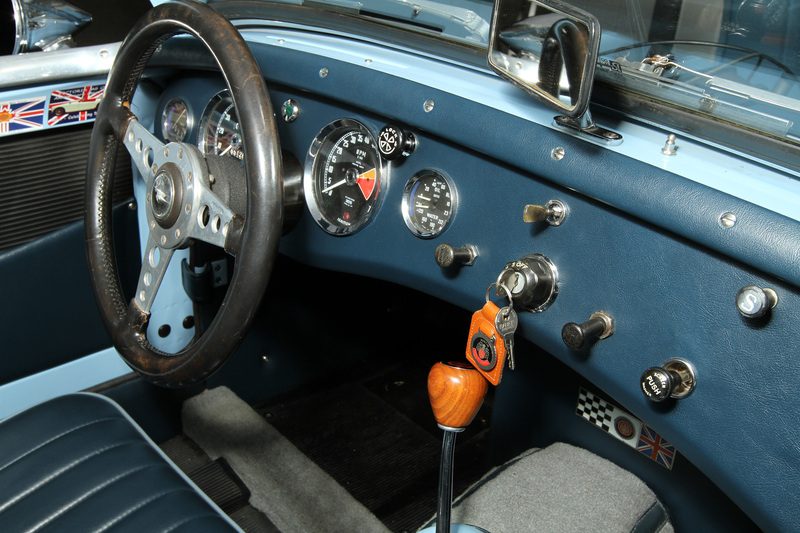 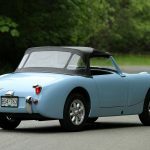 Anyhow, it has been outfitted with a roll-bar the stronger 1098cc engine from a Sprite MkI or Midget MkII. 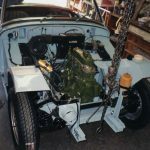 This probably indicates some sort of motorsports use, so if anyone has images or knows of a white Bugeye, with red interior and a Brookland Race Windscreen that use to race back in the day please let us know. 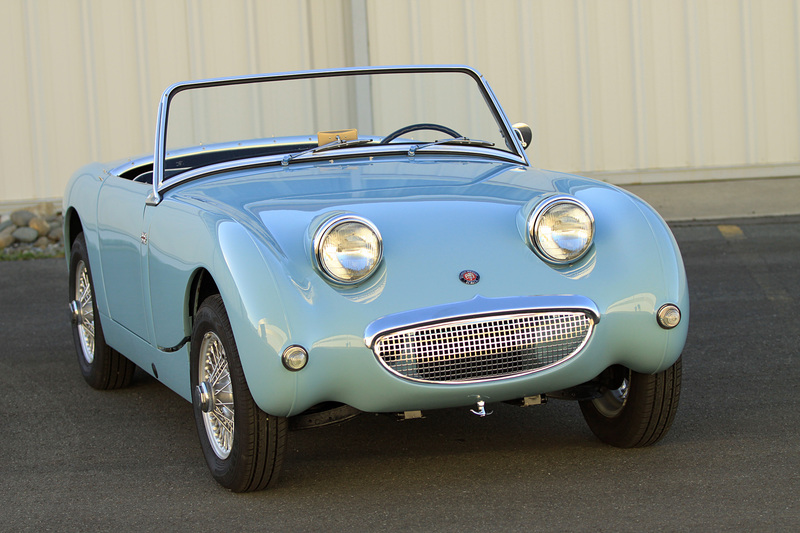 The absolute easiest way to distinguish this car is the Fred Deeley badge on the back. 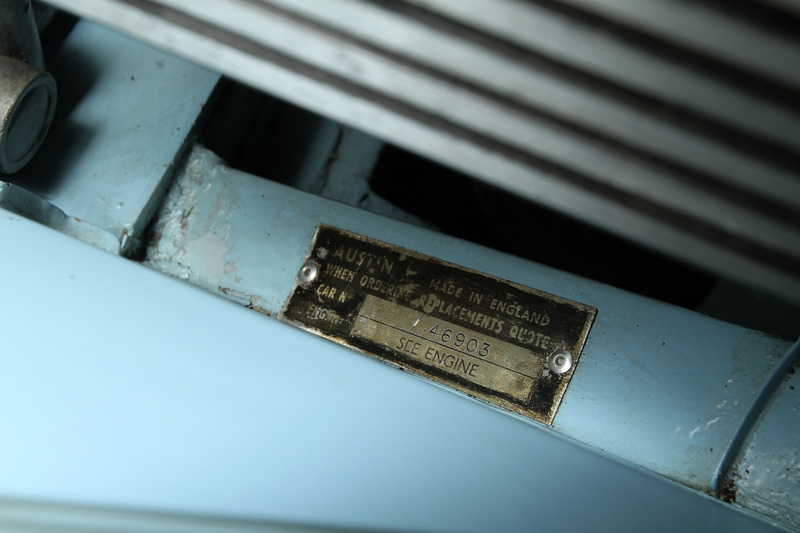 Sometime in the 1970s it appears the car was refitted for road use. 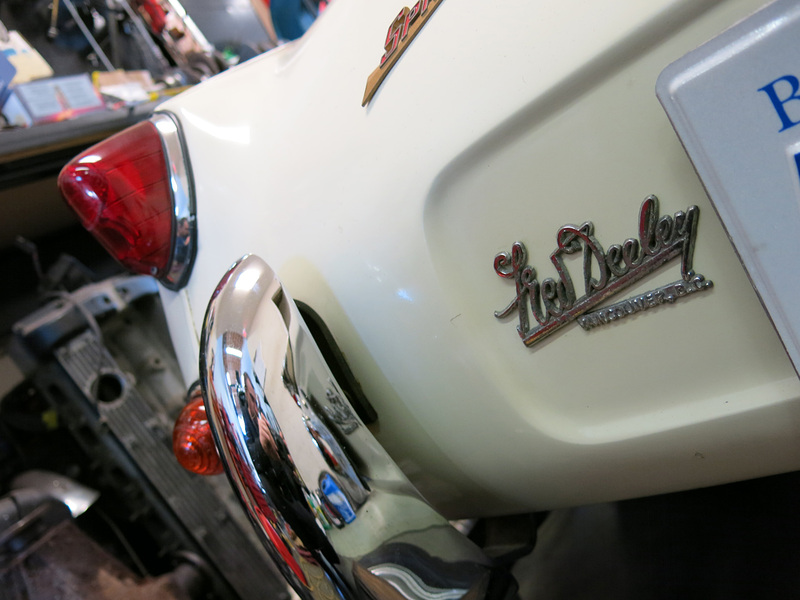 The original Moto-Lita wheel is a real treat. 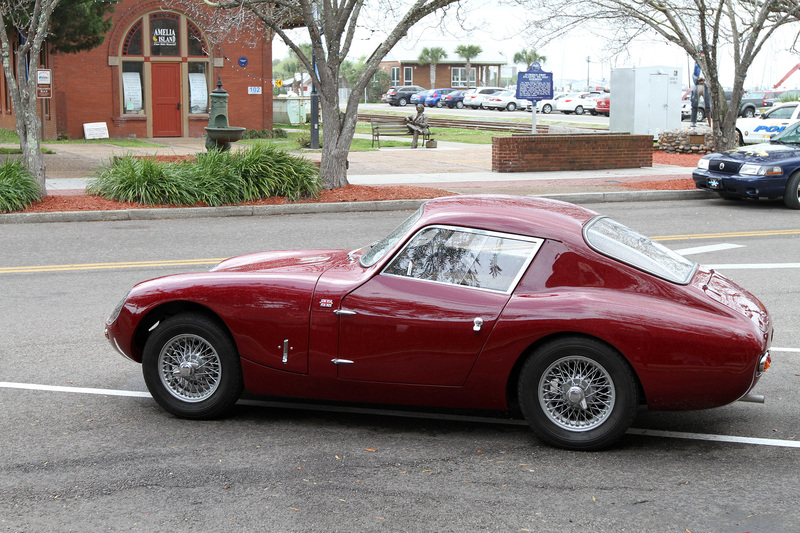 Today we ran into Bill Emerson’s WSM Sprite on the Passport Transport Eight Flags Road Tour for the 2015 Amelia Island Concours d’Elegance. 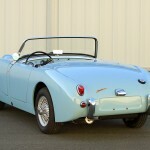 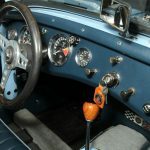 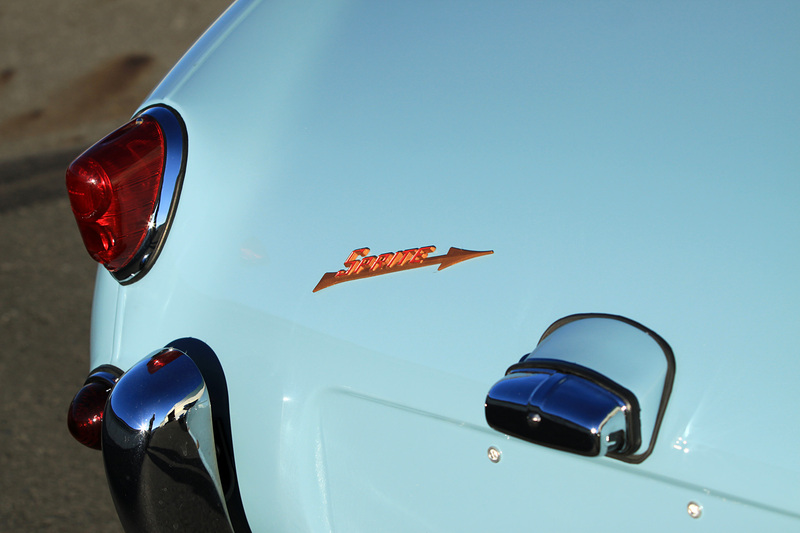 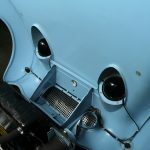 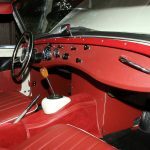 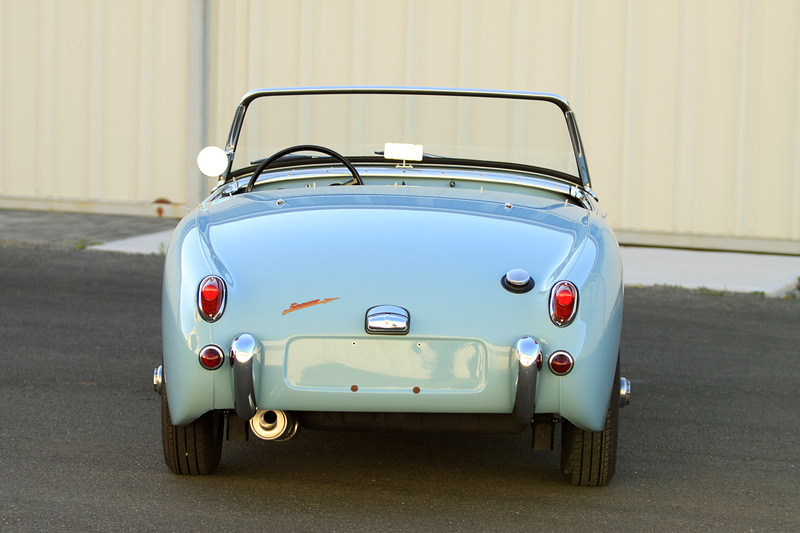 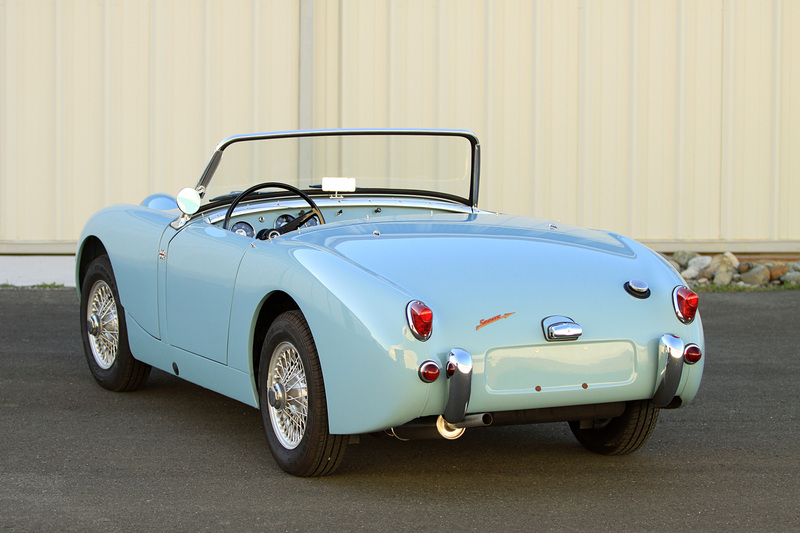 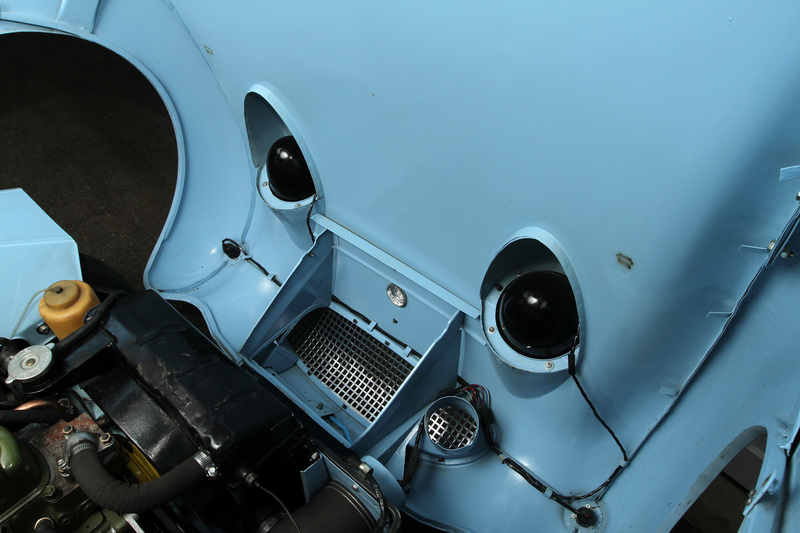 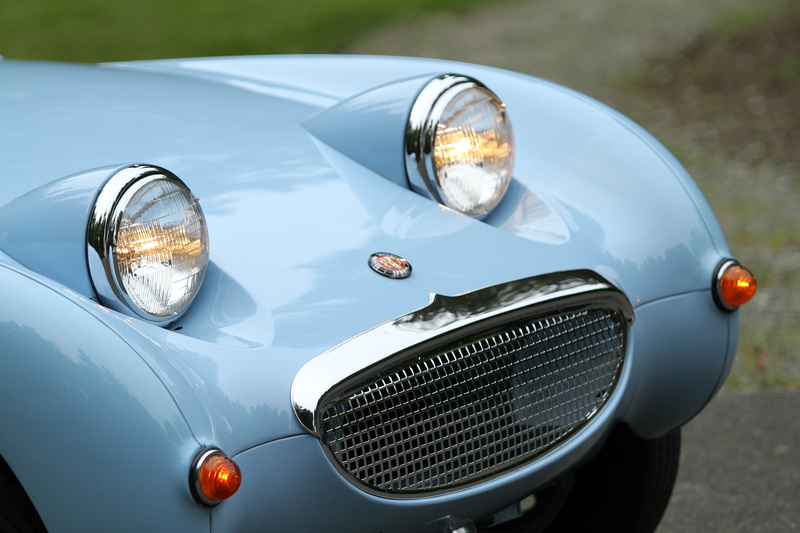 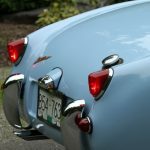 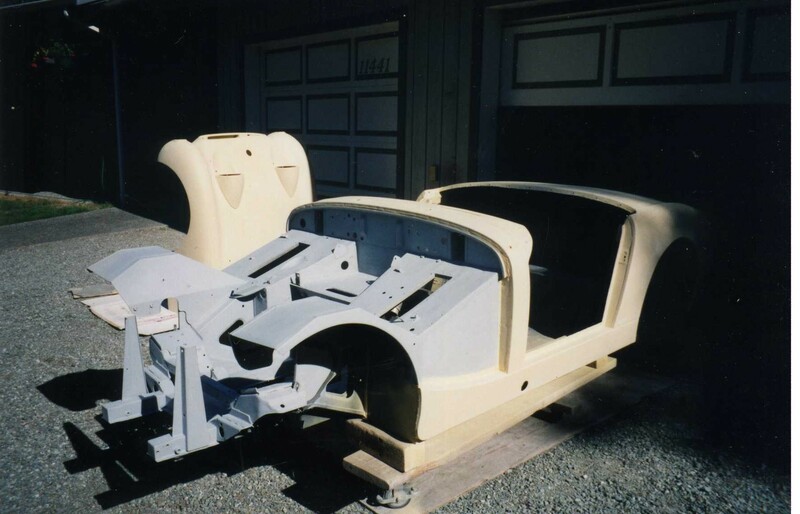 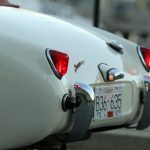 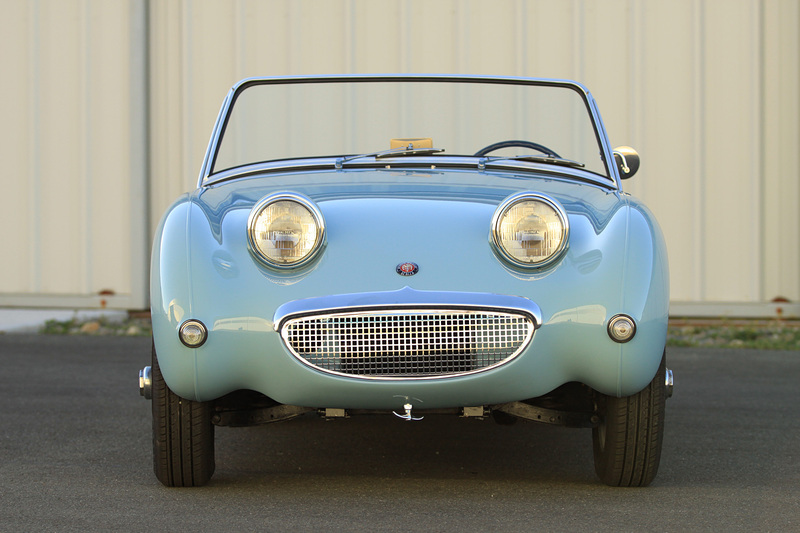 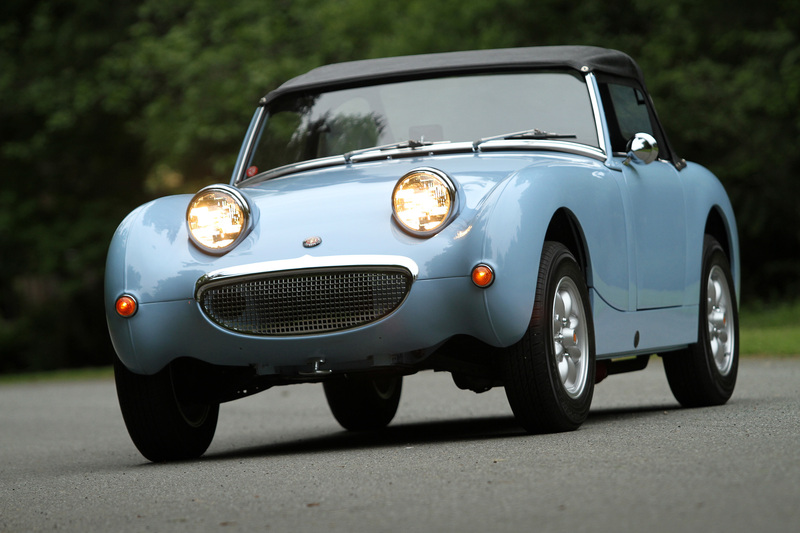 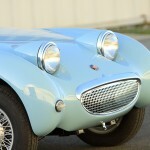 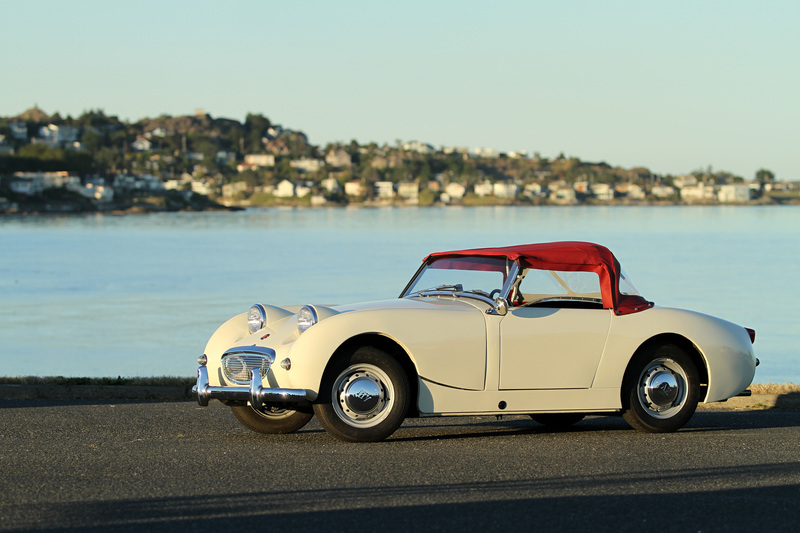 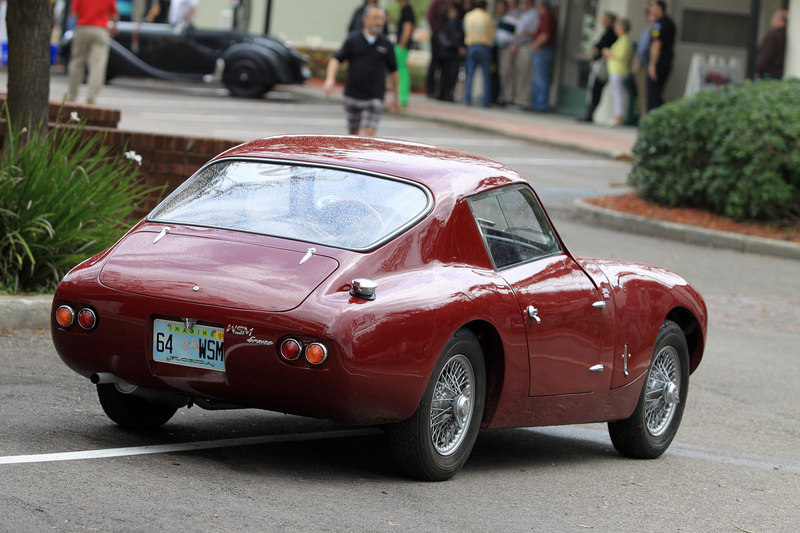 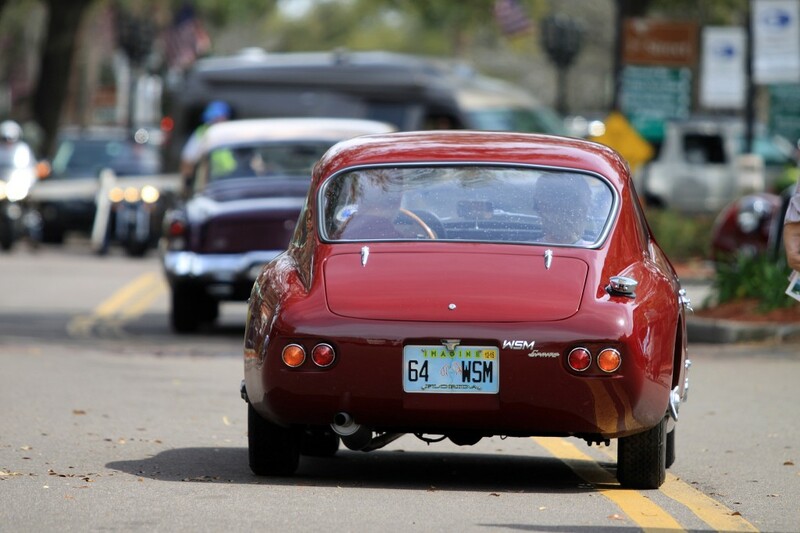 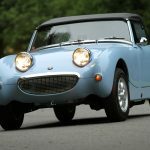 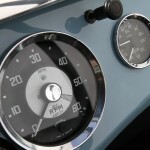 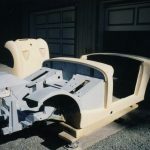 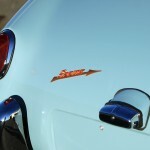 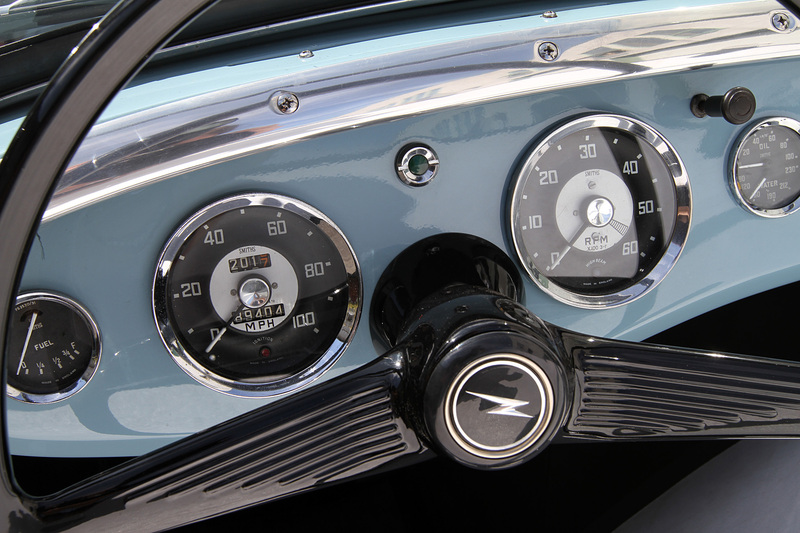 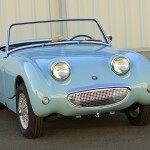 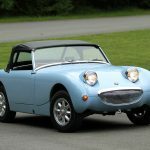 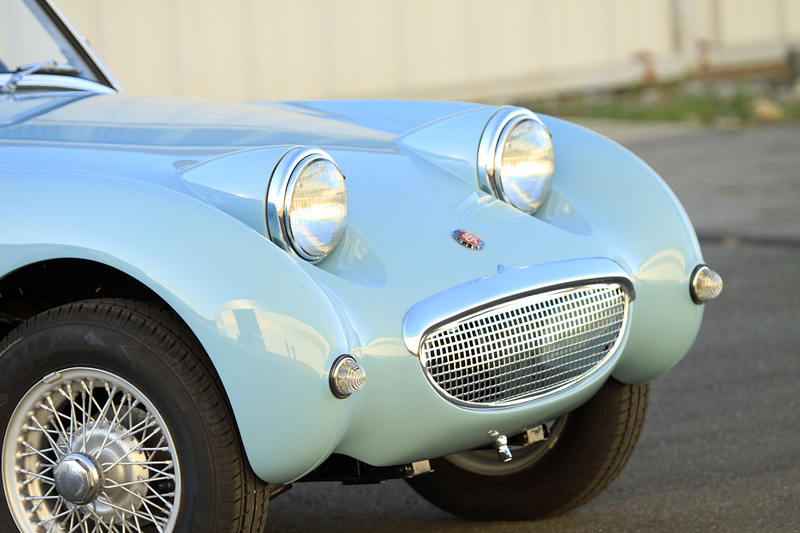 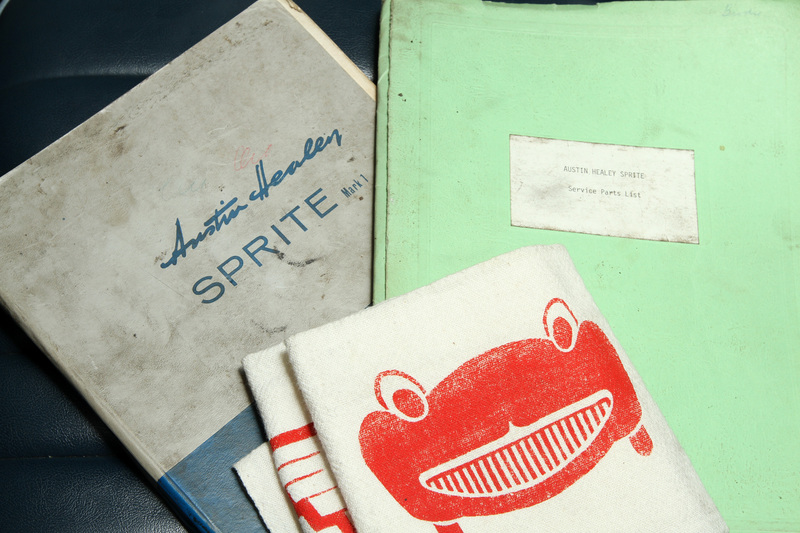 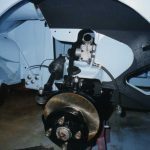 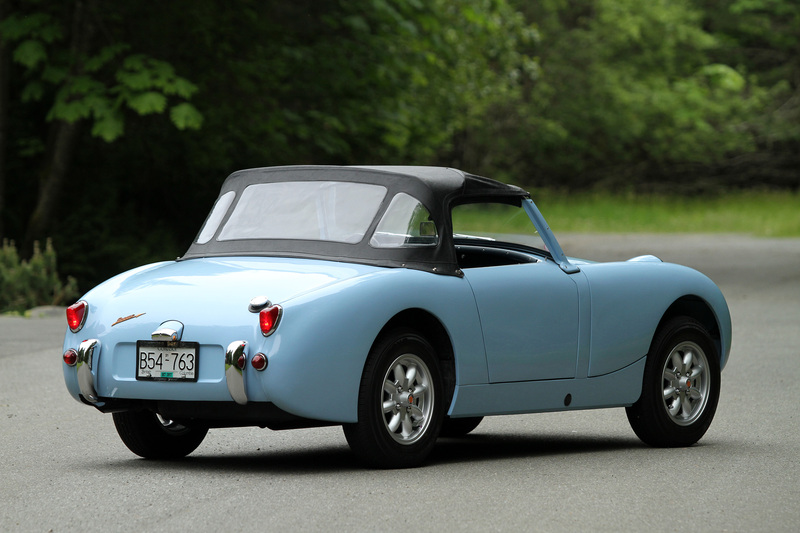 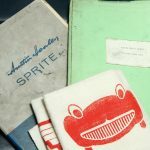 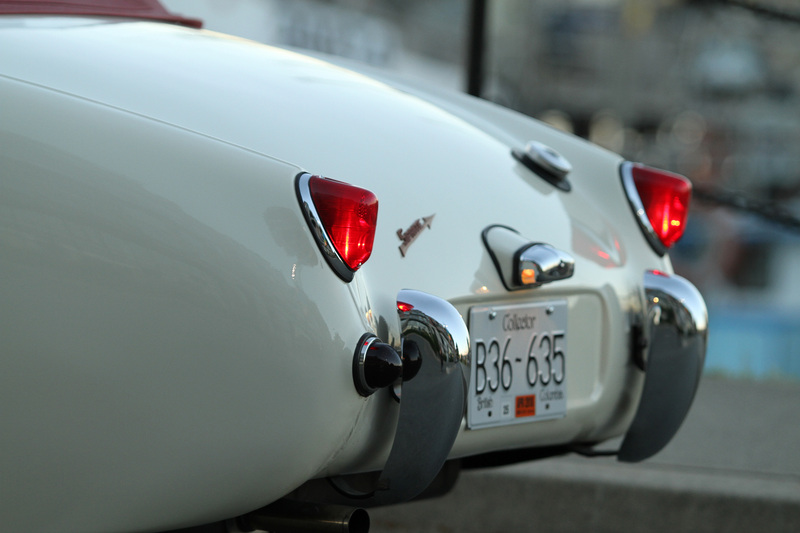 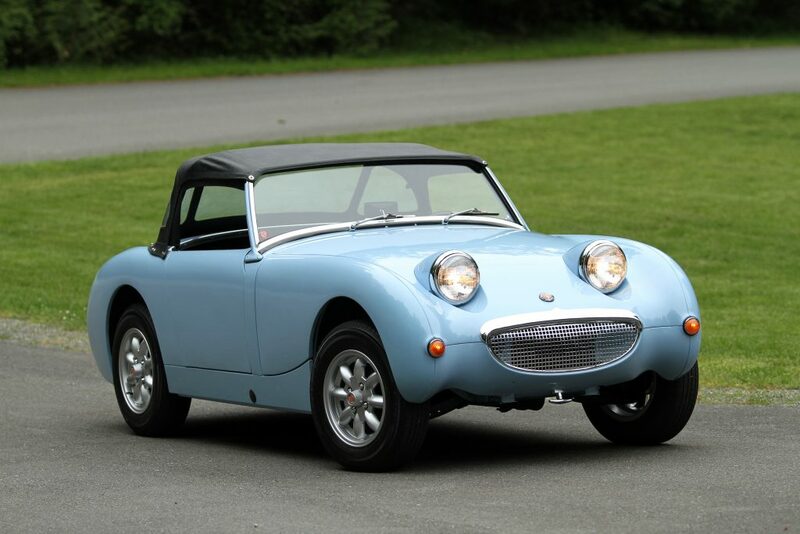 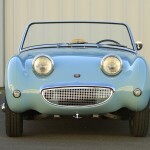 The WSM Sprite was originally conceived by Douglas Wilson-Spratt as a Bugeye Sprite with a streamlined fiberglass body. 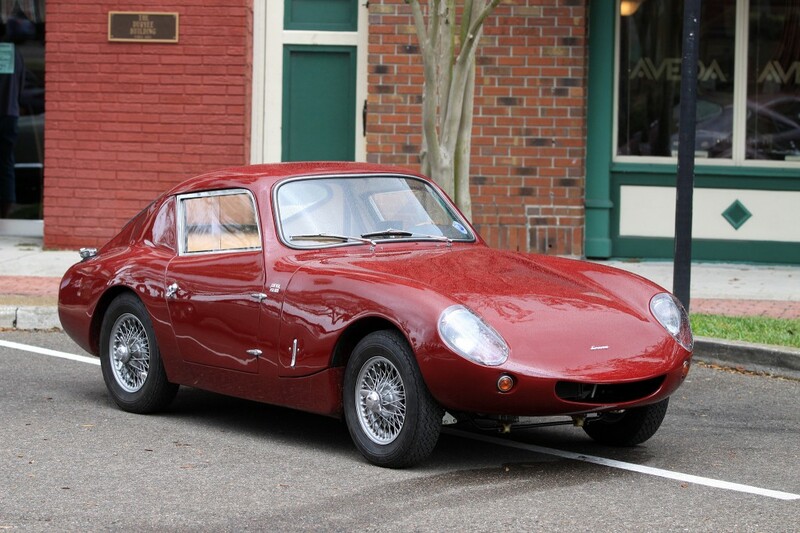 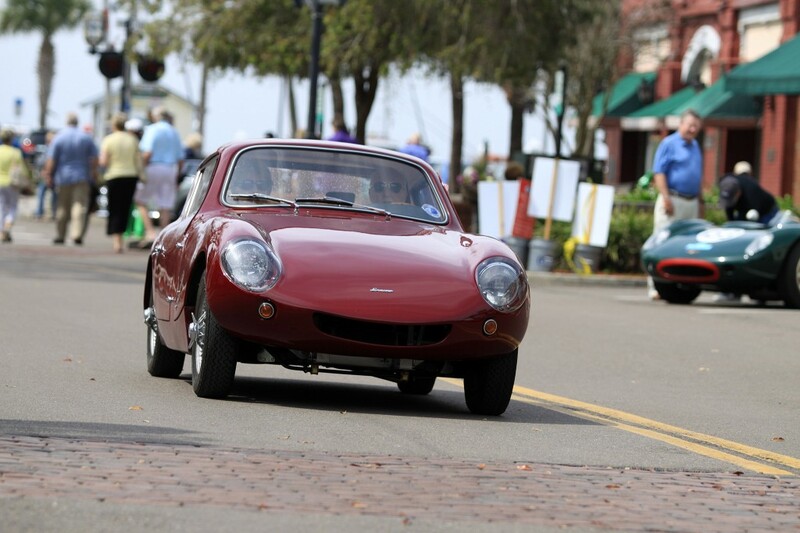 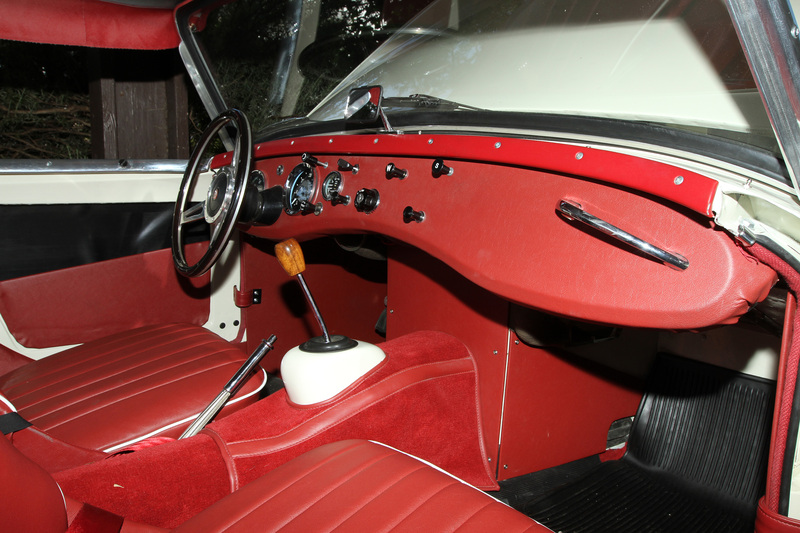 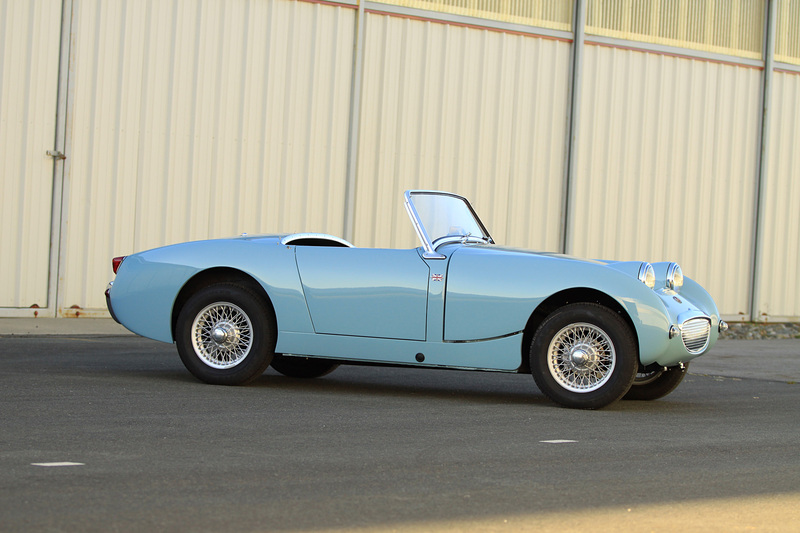 In 2012 this car was built as a Sanction II model by the Spratt family utilizing an original 1964 Sprite donor car. 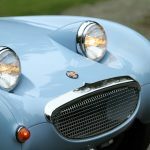 Bill is no stanger to Austin-Healey’s as he is the author of The Healey Book which chronicles every car and boat created by Donald and Geoff Healey between 1946 & 1978. 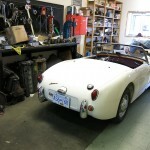 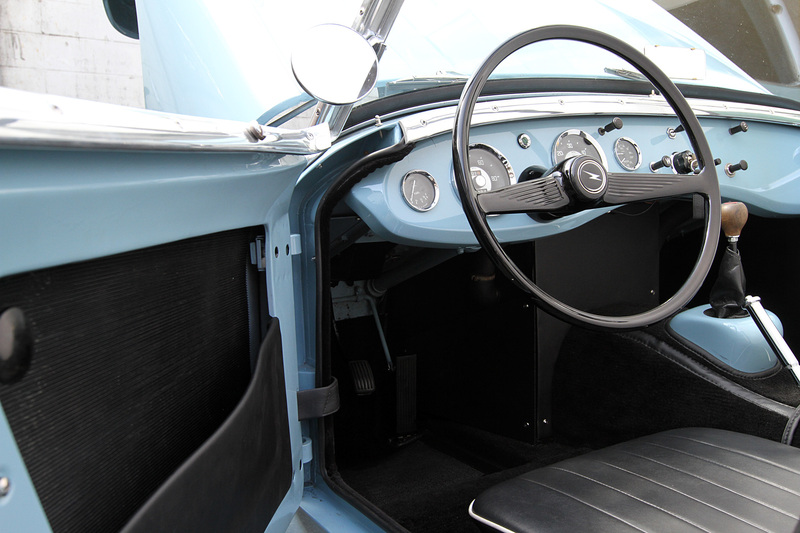 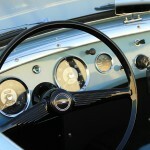 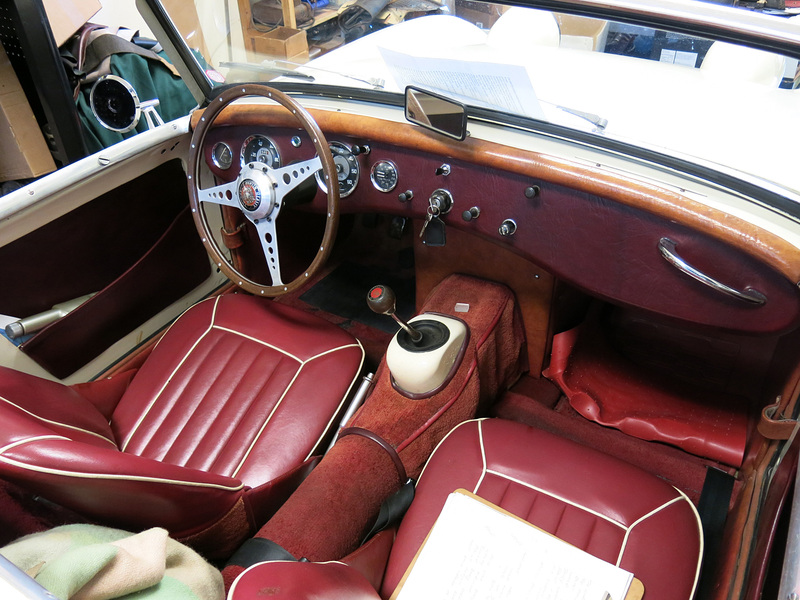 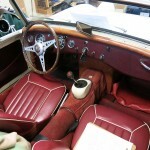 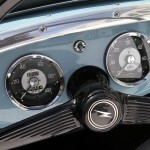 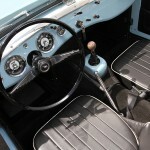 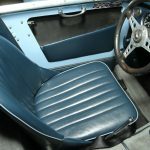 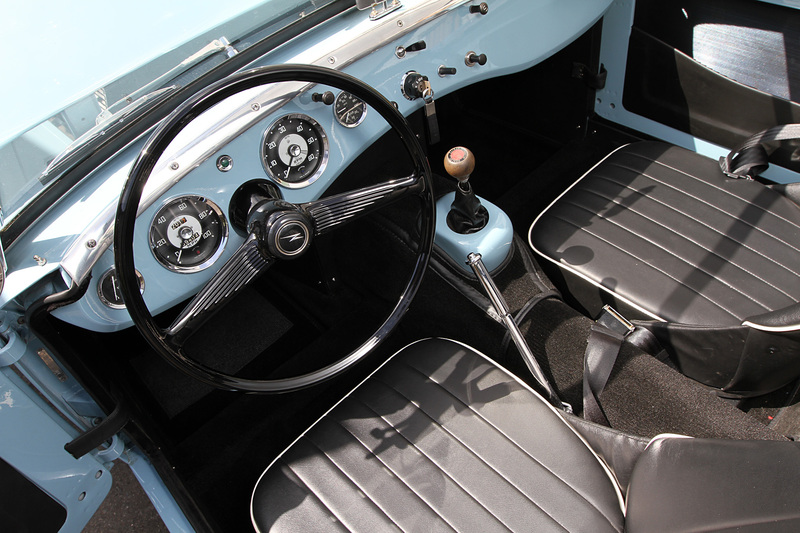 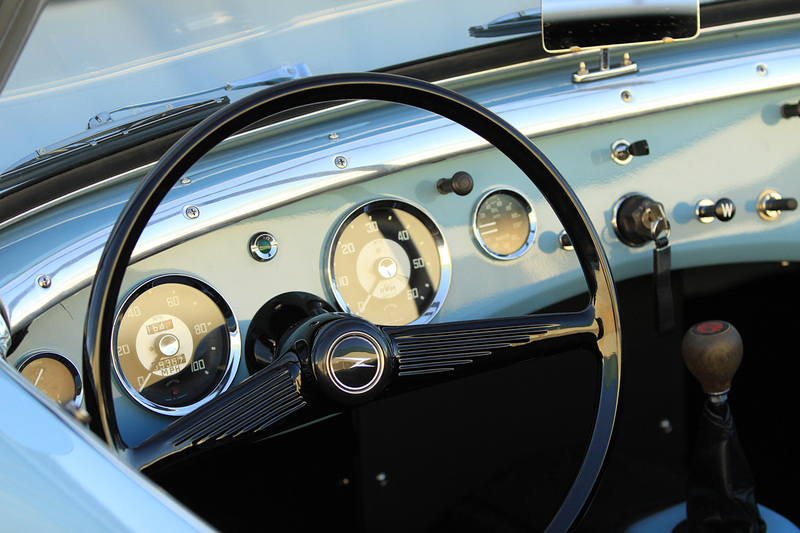 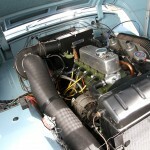 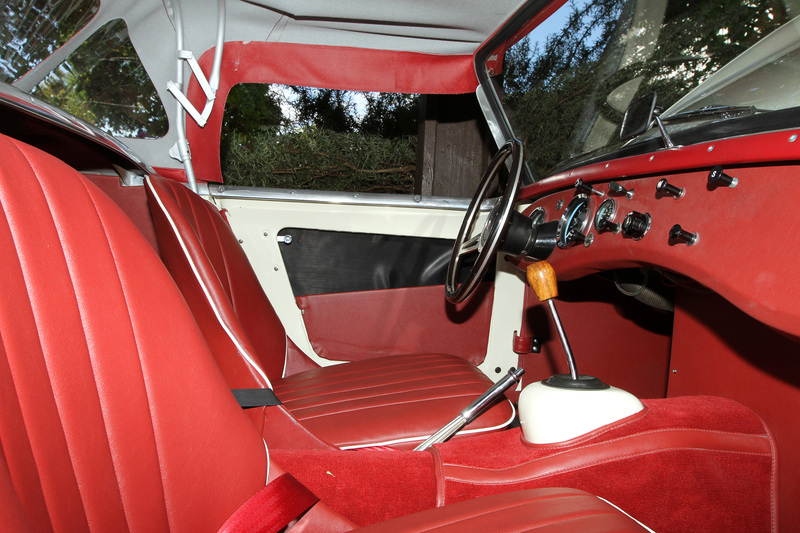 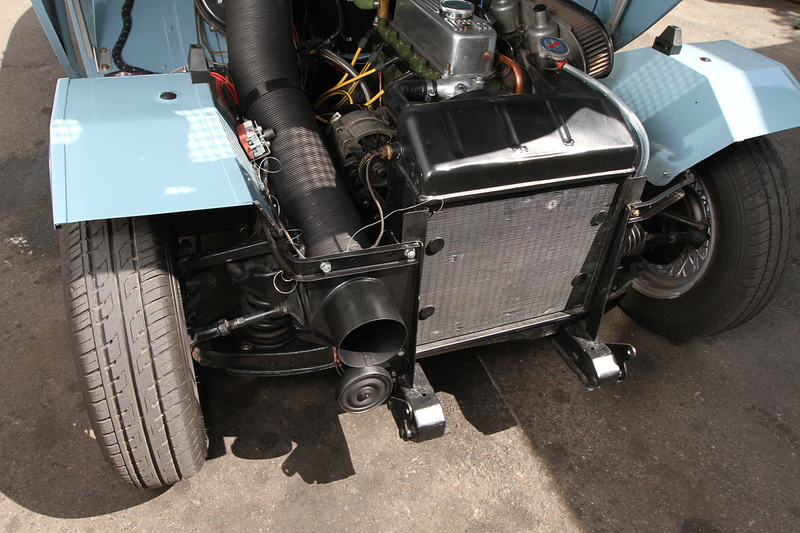 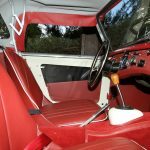 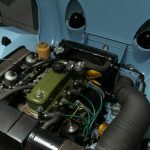 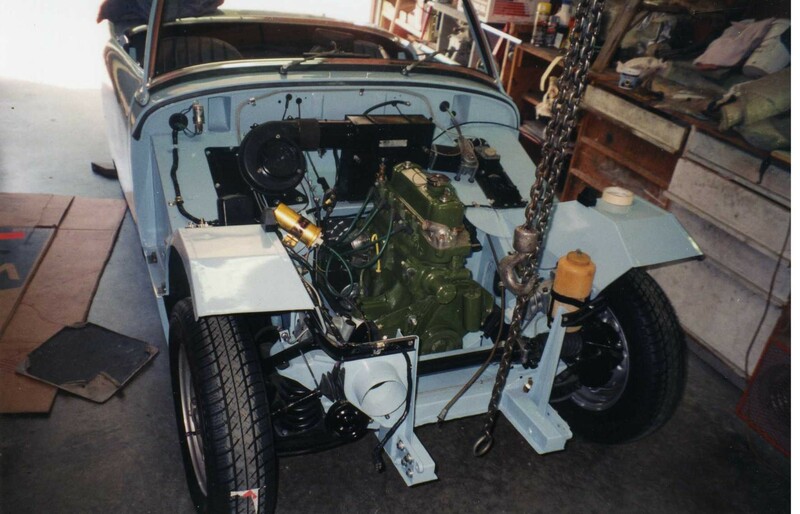 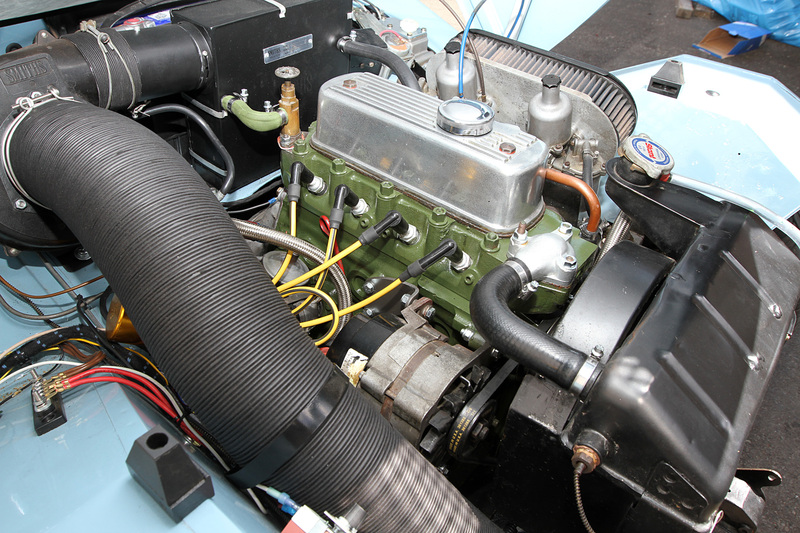 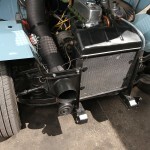 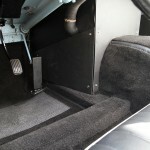 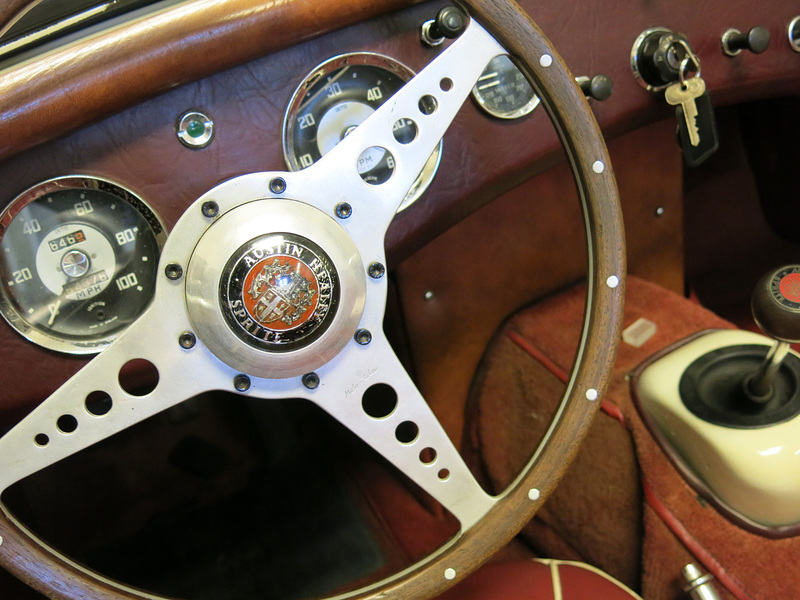 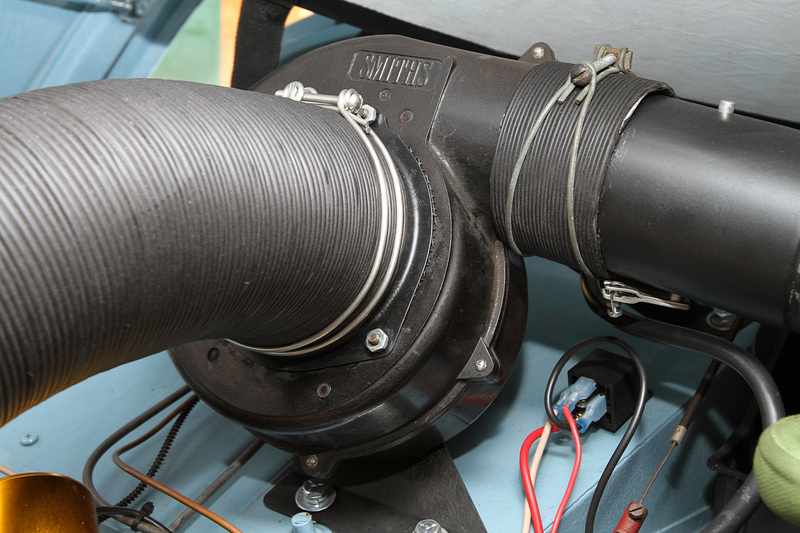 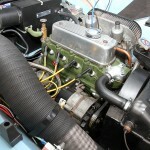 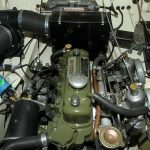 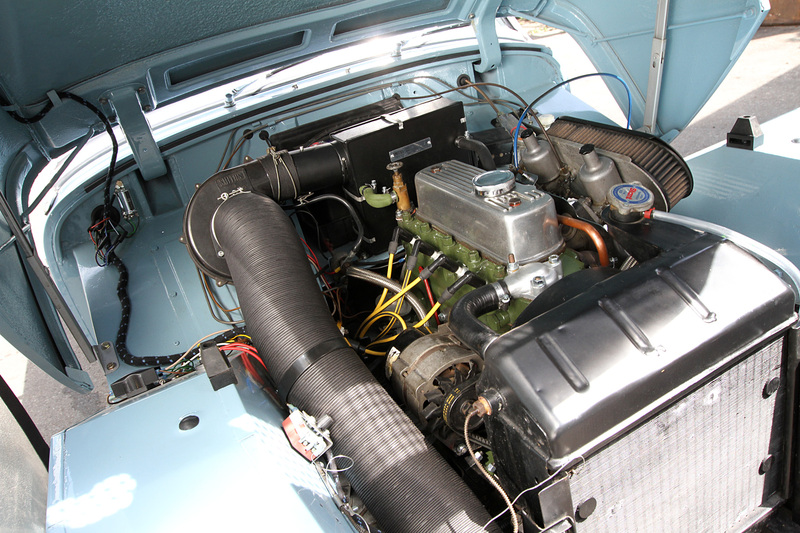 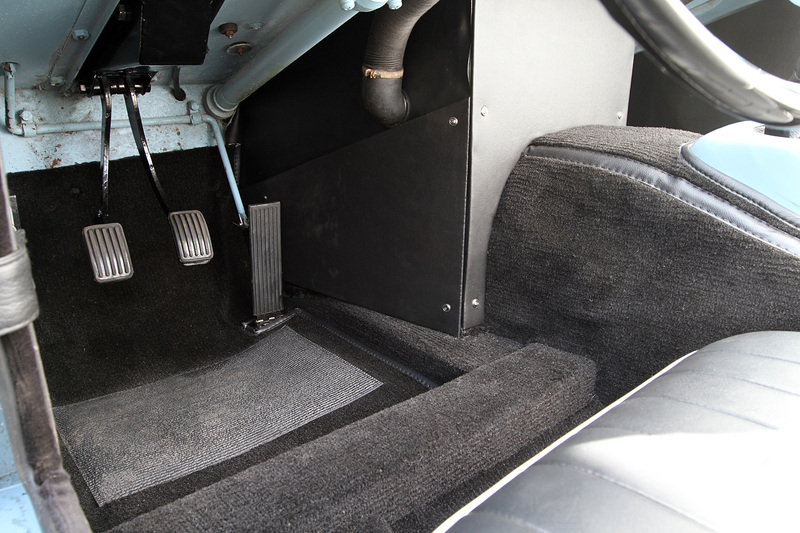 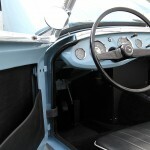 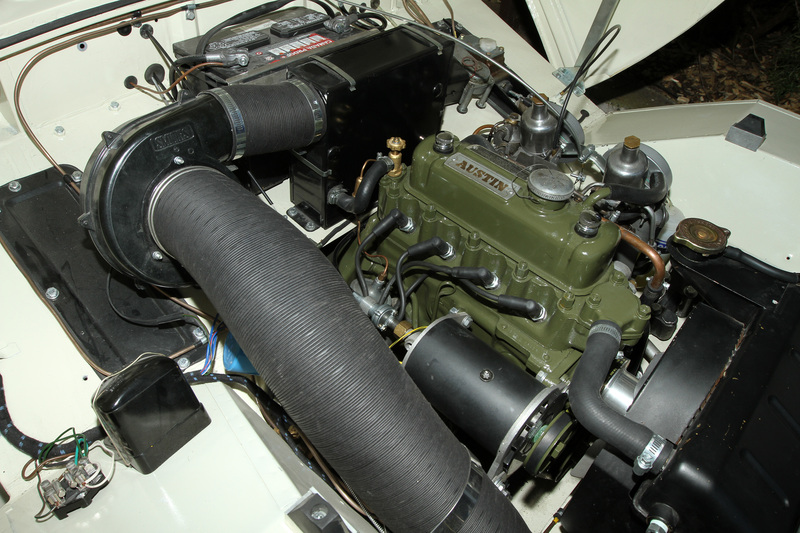 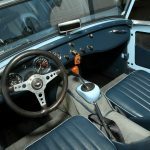 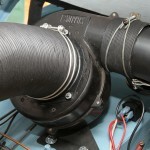 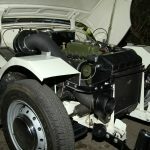 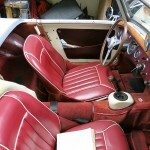 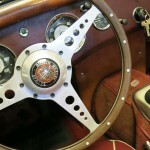 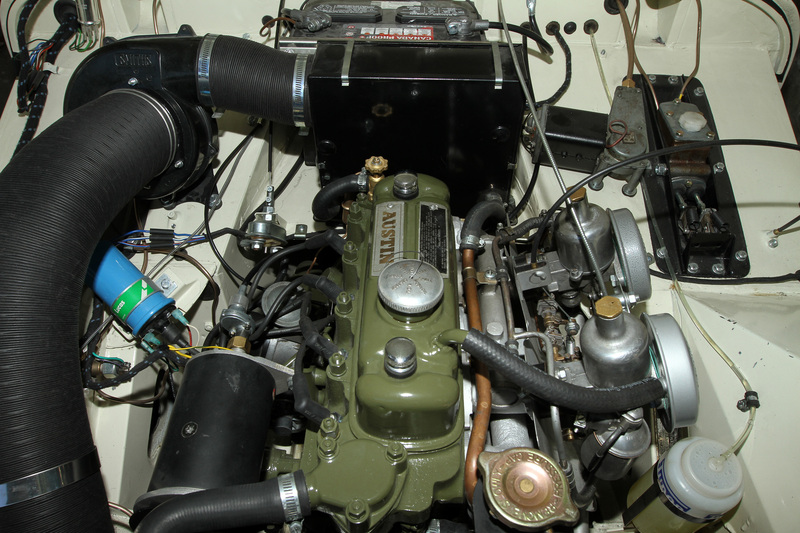 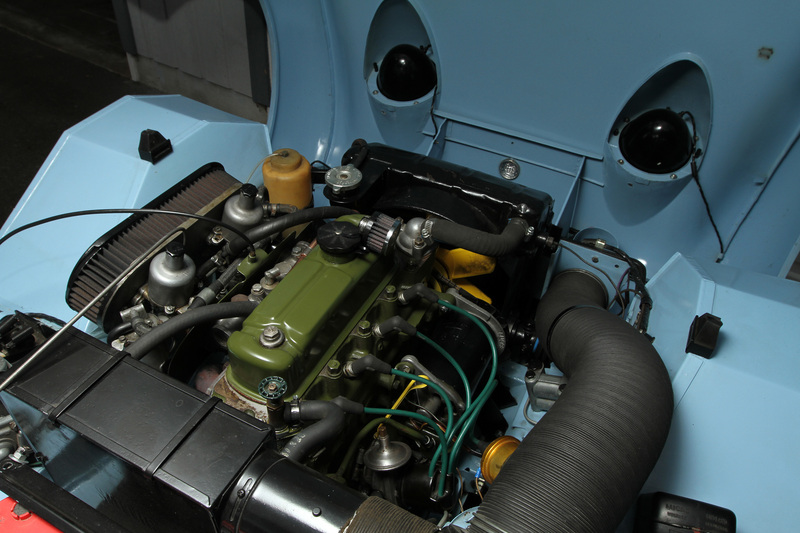 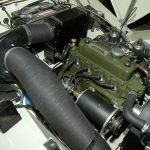 -Fitted with original Bugeye heater system and working blower motor. 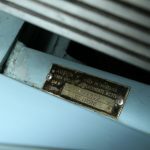 -Sold as is with no warranties.